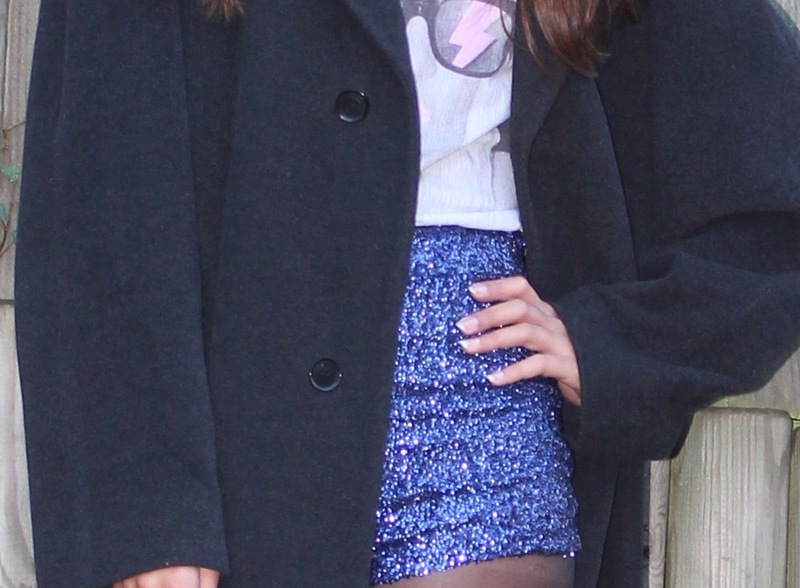 Just before Christmas, I was shopping in Topshop and stumbled upon some midnight blue high waisted, tiny sequin shorts. My inner fashion magpie was immediately drawn to them but the tiny bit of my brain which worries about practicality wasn’t convinced. The worst thing about shopping solo is not having an enabler on hand to justify those impractical purchases. So thank you to Instagram for letting me share a picture (above) of me wearing the shorts and thanks to the dozen or so enablers who immediately encouraged me to buy them. Now, with the shopping bag swingingly happily from my hand, I just needed to figure out how to dress them down…. It actually turns out that it’s not that hard. The best fashion antidote to anything shiny and tight is laidback and loose, making for a perfectly nonchalant outfit with a touch of sparkle. It’s practically one of the basic rules of fashion, like choosing to either wear a low cut top or a short skirt. I actually threw on one of my dad’s coats with this outfit, it’s so nicely tailored on him but super slouchy on me so it works really well against the sparkly shorts. The tee is a Gaga tshirt, as superficial as it sounds I’m not a massive fan but I really like the design of the t-shirt. The boots are actually a fairly new purchase from Sarenza but I’ve worn them to death already. You know one of those pairs of shoes which seamlessly fits into your wardrobe and manages to give an effortlessly cool edge to everything? A rare find which are perfect for dressing down my shiny, sparkly little finds. Det er forbløffende. Hold udstationering Gal….! Looking stunning, I LOVE how these shorts look on you. Gorgeous shorts you look amazing in them. you chose well! Loooove these! !